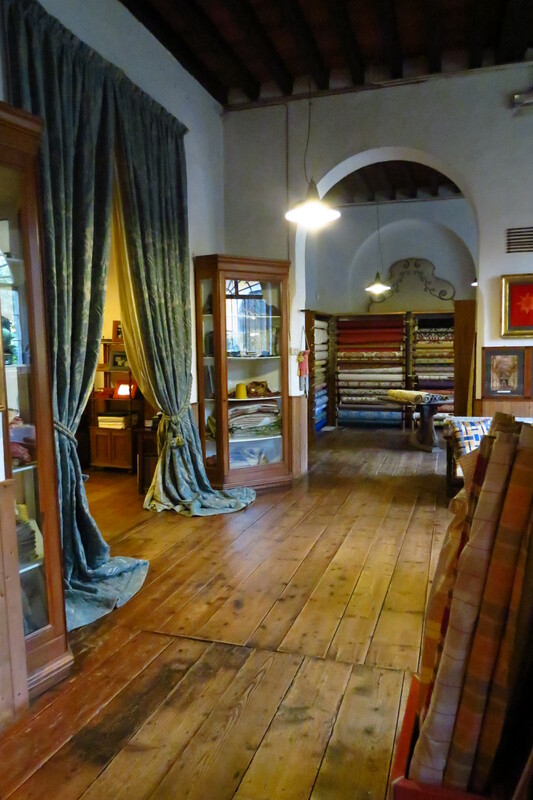 Because I am a weaver, while in Florence I was eager to visit Antico Setificio Fiorentino, a silk weaving workshop founded in 1786. 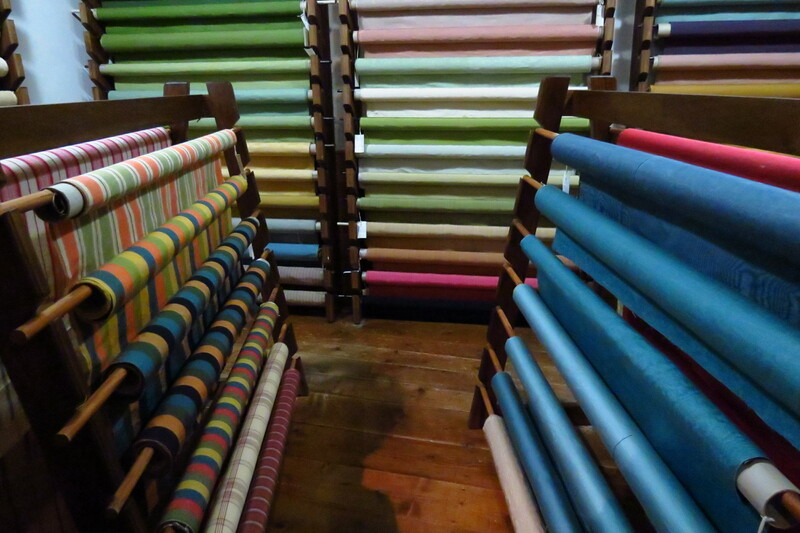 It produces exquisite fabrics on antique looms using original patterns that have been used for generations. 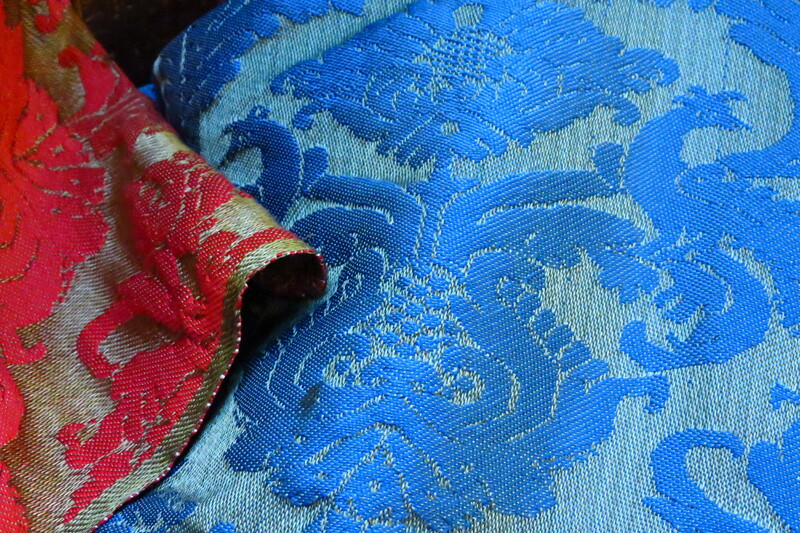 These fabrics include brocades, satins and shot silks. The workshop has been affiliated for some time with the fashion industry, and its textiles are sought today by royalty, by museums, and the very wealthy, all those who seek the finest materials for upholstery, curtains and aspects of couture. 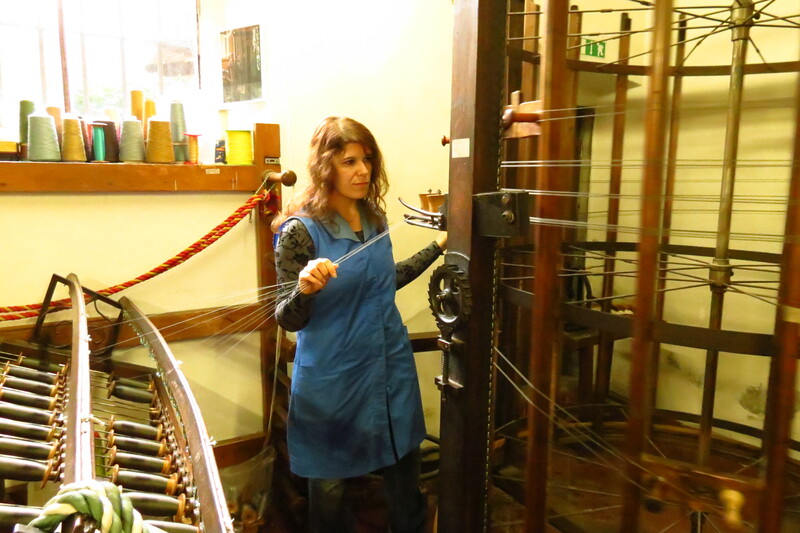 Our guide, Chiara, showed us the machines used in the workshop. The first sensation as you step inside the front doors, naturally, is the loud clatter of flying shuttles and beaters. Most of the looms are hand operated but at least one has a power-assist. The machinery falls silent as the tour approaches and Chiara explains what particular task is going on. 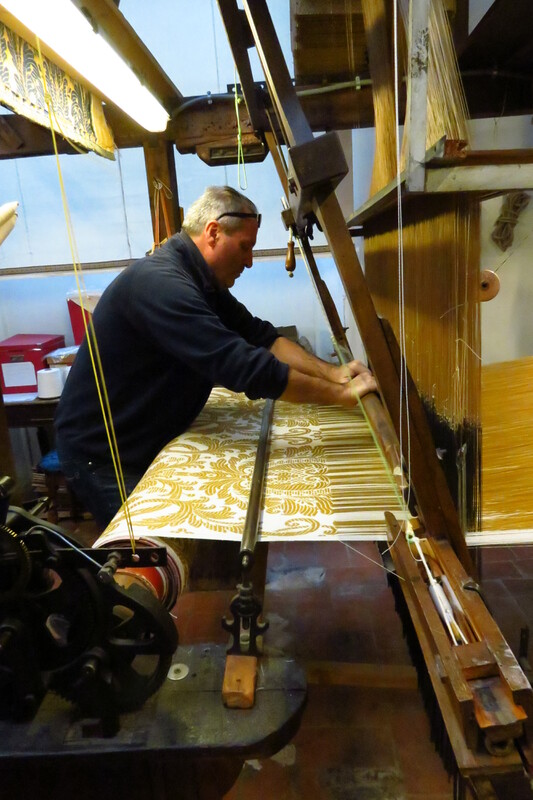 The first machine we viewed is a specialty loom which makes narrow fringed and looped bands for the edges of curtains and pillows. 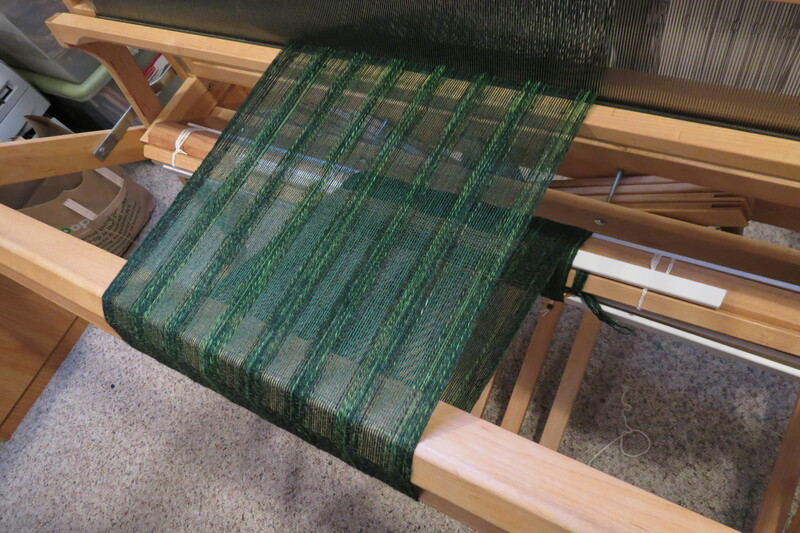 Look carefully at the photo below (click any photo to enlarge) and see the woven tape forming on the left, while on the right the weft is passed around a slender metal rod affixed to the loom. 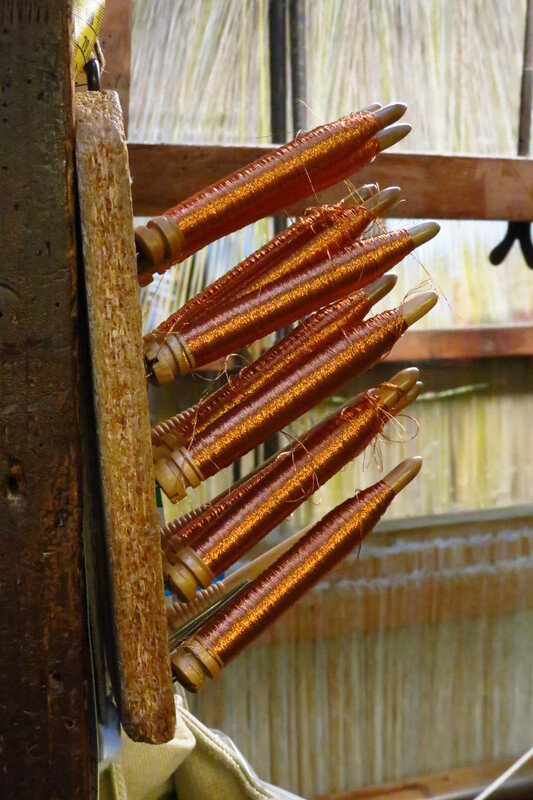 The silk threads along this rod can be cut, resulting in a long fringe. 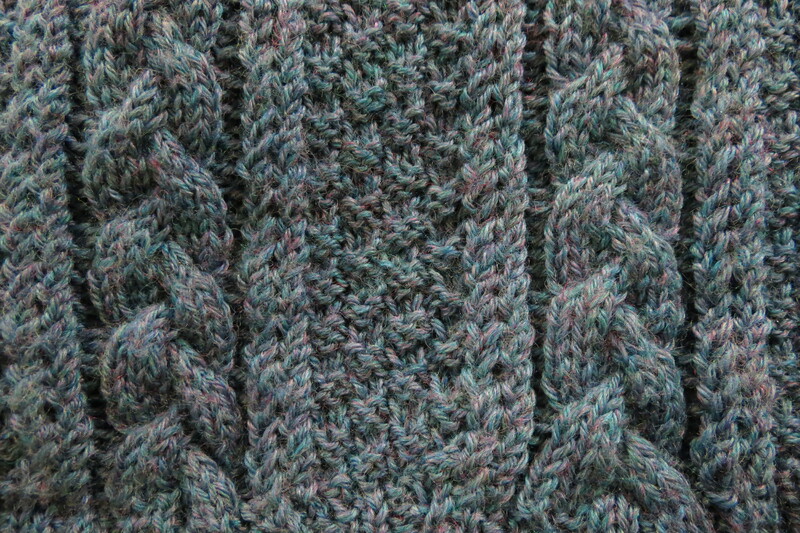 Below is a close view of this pattern. The visitor passes by many looms, some of which are in use, some of which are being warped, and others which lie waiting for the next project. 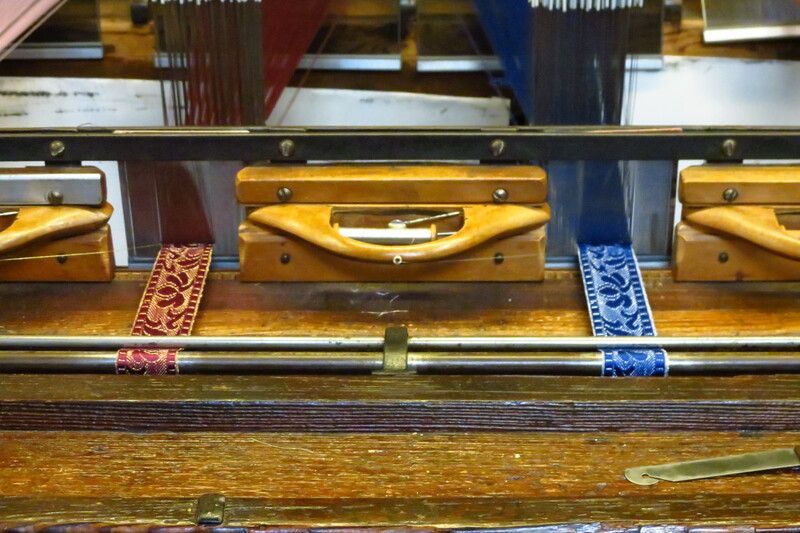 Some are Jacquards but others appear to be sophisticated hand-operated drawlooms. 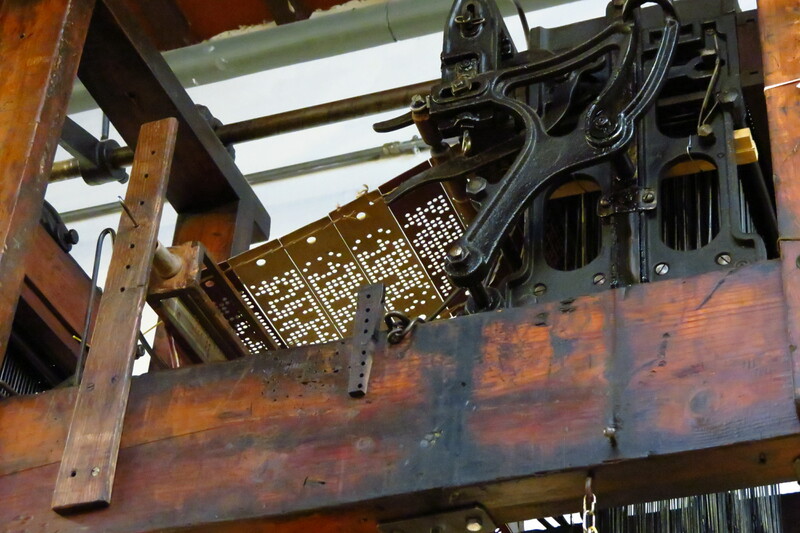 The pattern cards for the Jacquard looms make it obvious that this was the origin of the first computer punchcards. Each of these cards lifts a unique set of heddles to form a complex brocade pattern. 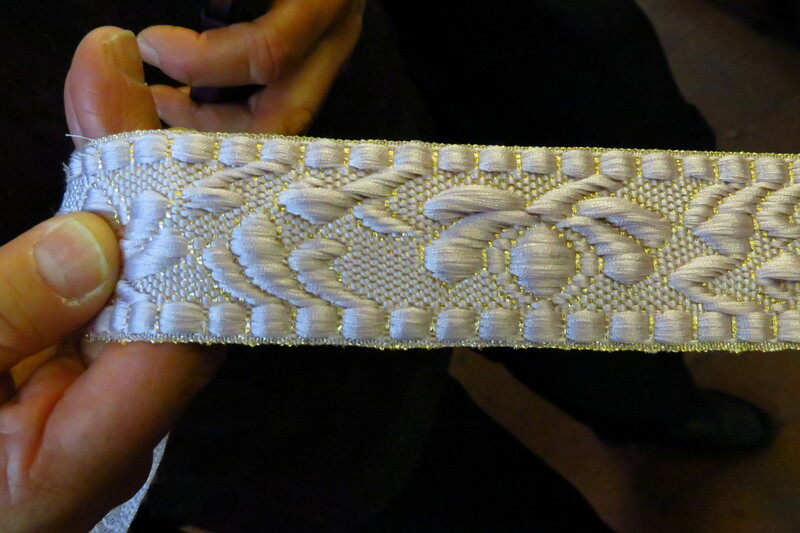 Each card is a slight variation on the preceding card, all of them harnessed together in a long chain to create the full pattern for the brocade. 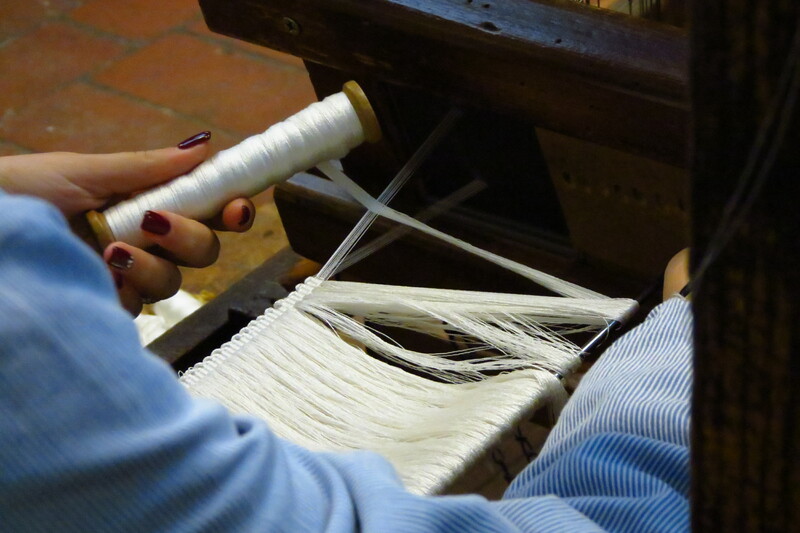 Below an employee is weaving a sturdy upholstery fabric that unlike the others, has a linen warp. A strong arm is necessary to beat this fabric to the desired density. 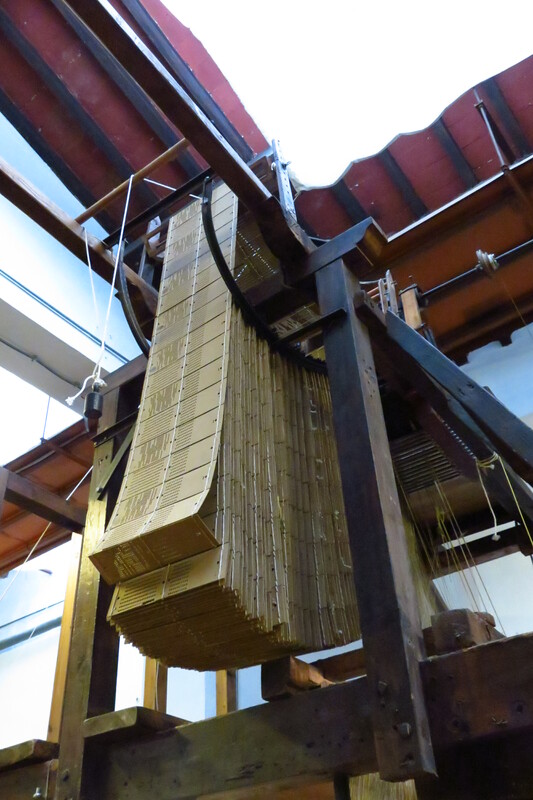 The warping is done in a separate room from the weaving, using (in part) a warping reel originally devised by Leonardo da Vinci. 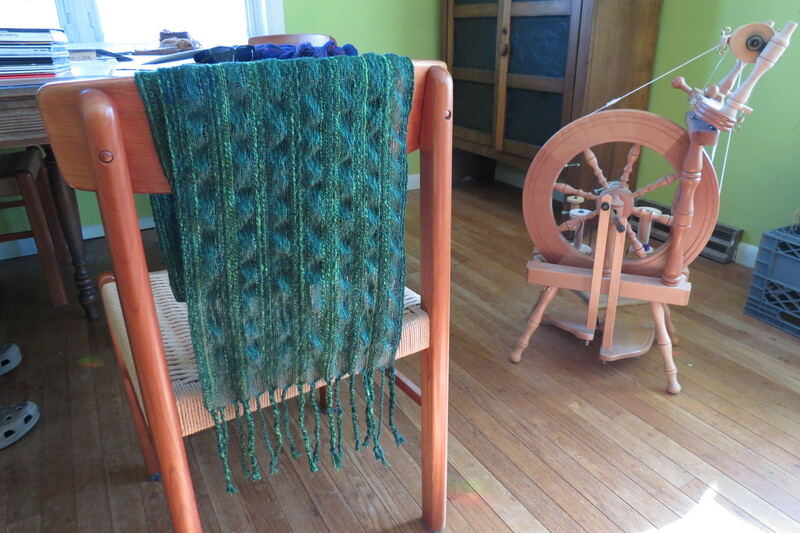 Note that a number of threads are being simultaneously passed from the bobbins on the left to the reel. One needs soft, smooth hands to do this successfully! 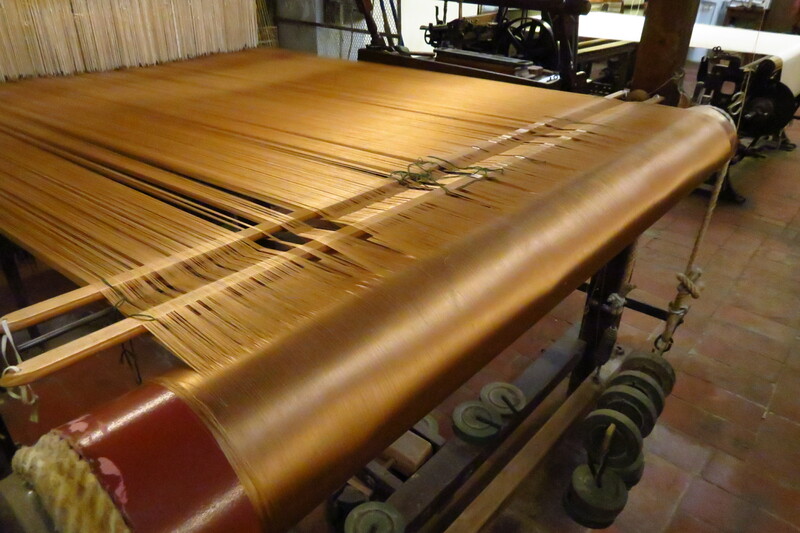 Some of the looms incorporate metallic threads as well, imparting a high sheen that catches the light. Below is a closeup of some of the metallic threads. Notice how in the fabric below, the light strikes the surface differently from left to right. Also notice the white band along the left edge; it appears to be a measuring tape that tells the weaver how much longer the yardage needs to be. 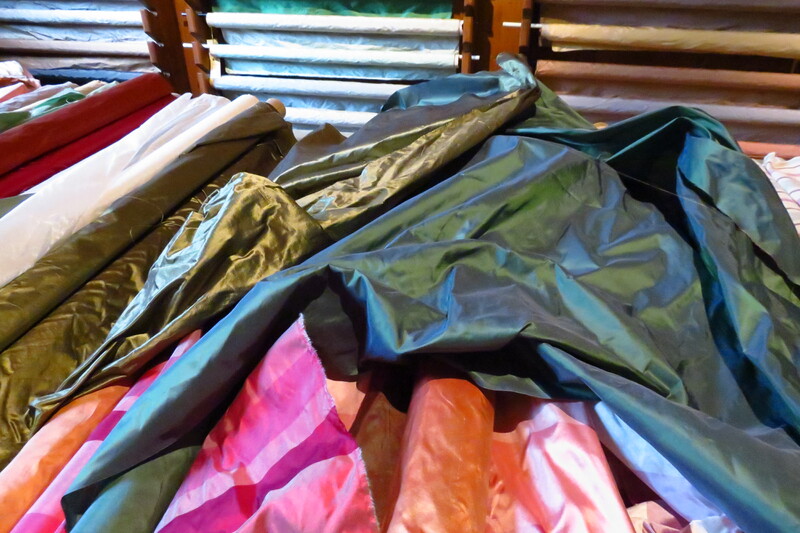 The wealth of colors and textures available in the workshop’s showroom is deeply impressive. The handwoven textiles are naturally expensive, for they are top-quality and tops in beauty. These fabrics represent the ne plus ultra of weaving. 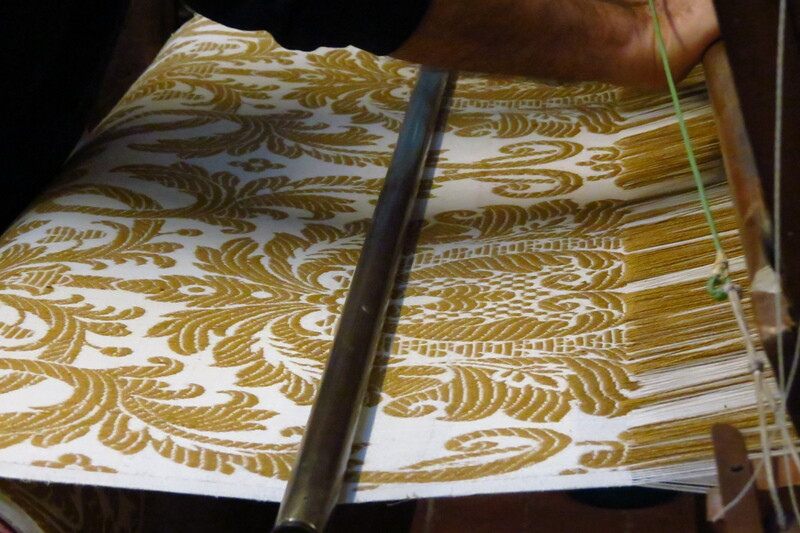 The Kremlin recently commissioned silk velvets for upholstery purposes from Antico Setificio Fiorentino. 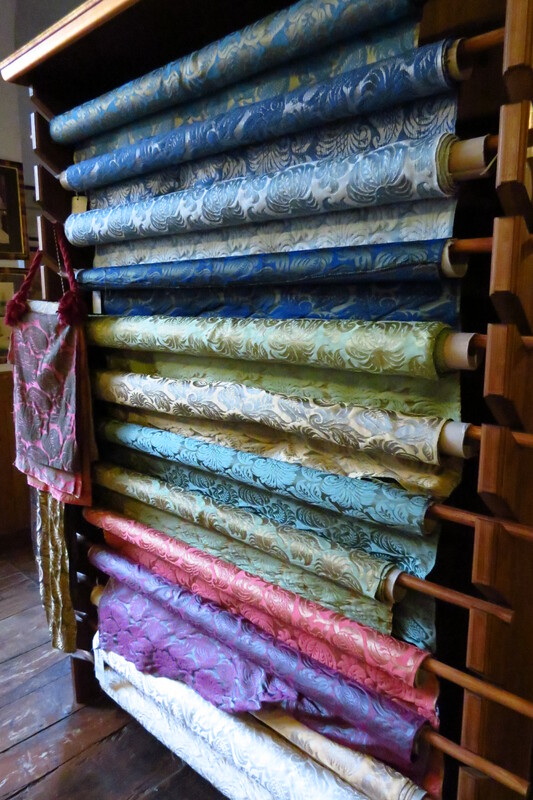 These fabrics you’re looking at are the same ones used by royalty. 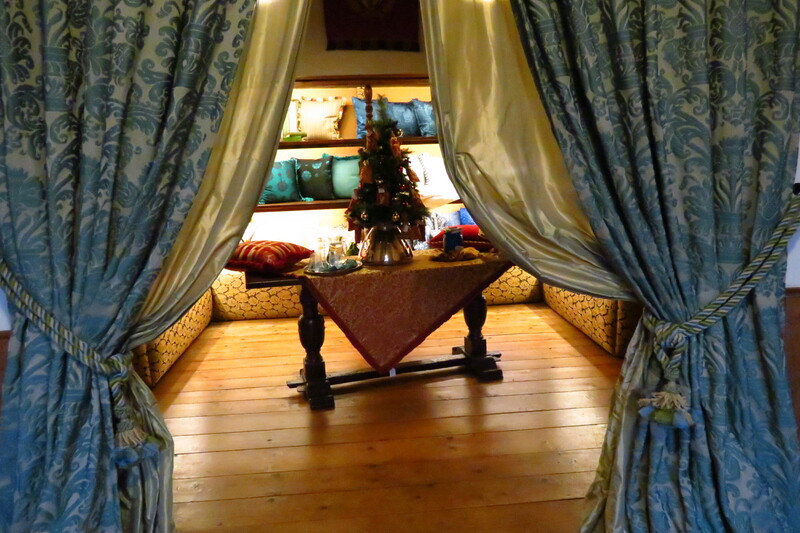 Here is a long view of the atelier, showing magnificent drapes made on-site. The beauty of shot silks—one color for the warp, and another for the weft—is exactly as you might see in a painting by Fragonard or Boucher. 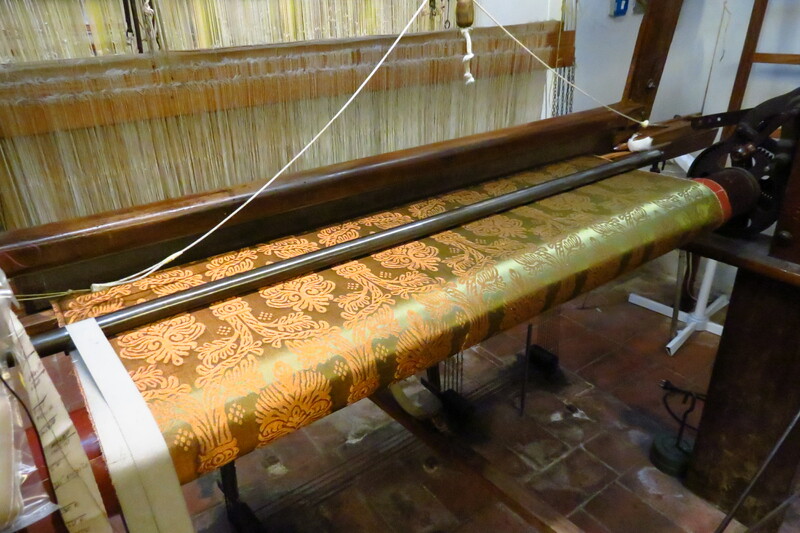 As a weaver, I was deeply impressed by the quality of the fabrics that are manufactured at Antico Setificio Fiorentino. 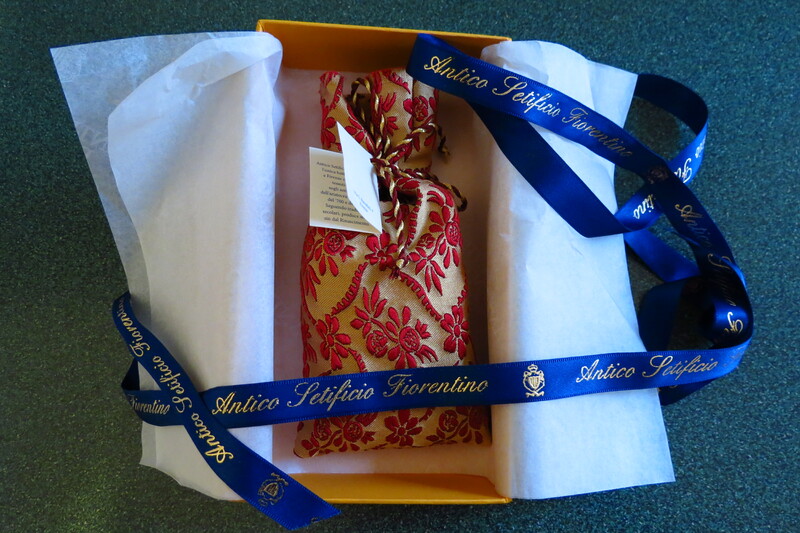 I left regretting that my budget did not permit me to purchase any yardage, but I did buy a lovely bagatelle: a sachet made of patterned silk woven on the premises, tied with a silken cord, and packaged in a bright yellow box with a customized ribbon. The scent is marvelous! Antico Setificio Fiorentina is located in Oltrarno south of the river on Via L. Bartolini, 4, 50124 Firenze. Email info@setificiofiorentino.it for information about how to take your own tour, and to purchase cloth fit for a king. Beautiful fabrics. Wish I could visit and tour. Wow.